As good I’m sure they can be in a perfect setup, if I’m being completely honest, I much prefer the 30.2s. 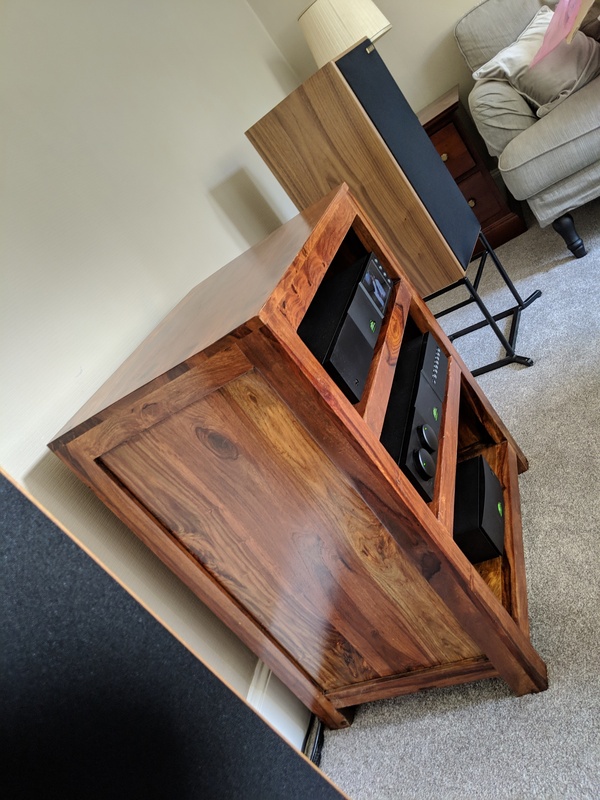 Even when I placed the SL2s against a hard wall and spread them apart (before my wardrobe installation) they did not exhibit the body of the instruments as well as the Harbeths do. Their speed is unsurpassed. And, I do agree that even with my less than optimum room placement, the bass did go low into the 30hz range. But I just wish there was more of it. 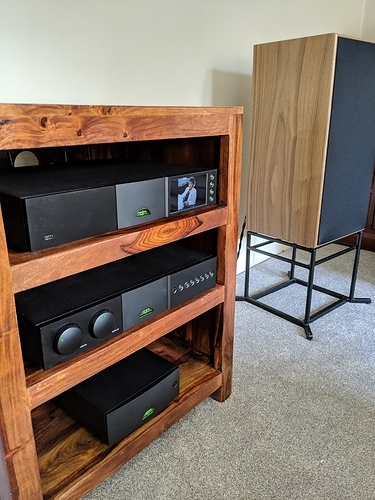 I’ve had the earlier HL5 for a long time, they seem to be so natural with the Naim components. I used to have them in a small apartment but now they have a bigger space and fill it out nicely. I would never give them up. I have harbeth m30.1 (in rosewood) mounted on a very non-conventional folding iron bookcase (container store). They work very well with a 282 hcdr/250dr system.The only area that could be improved upon is more (lower) bass and complicated large-scale (orchestras). The latter is not really a problem for me. The speakers were bought based upon reviews rather than demoing and I would easily recommend them. Perfect ? no, but very capable and never tiring to listen to. Each time I think of a change, I realize it would be difficult to find a speaker that improves on its strengths. Have run them with different sources/ amp, from Atom to Atom/ 250 to 272/250 and they really change with quality boxes. When I run them with Atom for some weeks I thought I could live happily with that ( and I can if needed), but adding classic boxes, what a change…! Another thing, they do perform very different when place at the long wall vs the short wall at my place (25m2). Those who experience bloated bass, give them some room to the sides/ long wall, I have no such bass issues. Well, I got a new NdX 2 and also wired in the HiCap DR. Very happy bunny. Cliche alert : stuff sounds more ‘live’. Fantastic. Top end sparkles! Even Simple Minds Ghostdancing from Once upon Time sounds alive and not compressed as it was. The cymbals and high-hat on Mel Gaynor’s drum kit sounds particularly good. Never sounded like that before. I have a very dead room. The room has thick sandstone walls on three sides, an airgap and then wooden lathen plaster walls and then wall paper. (Combined depth is half a meter), the floor is suspended wooden boards, on top of which plywood is laid, on which is very thick high quality floor insulation, on top of which a fitted wool carpet. The room has lots of soft furnishings. Also the ceiling is pretty high. Having the Harbeths slightly toed in and about 30cm from the wall works best here. Bass isn’t over powering, it’s just nice and tight. My first Harbeth was a pair of Super HL5 bought in 2009. During the first year I tried many amps with the speakers as I wasn’t entirely satisfied with the dull and laidback presentation. After toying around with at least 6 or 7 amplifier combinations the LFD provided a glimpse of hope. My first Naim experience was the Nait XS. It was a short experience as I compared it with the Rega Elicit mk2 in my system with the Harbeth SHL5 speakers back in 2010. I later ended up with a used NAC202/NAP200/Napsc in the same year driving the Harbeth for about 6 or 7 years. I later traded in the SHL5s for the SHL5+ and several months later upgraded the 202/200 to the 282/250DR/Hicap DR bought new. I find my current system to be very enjoyable and have no further urge to climb the upgrade ladder. After trying some of the Naim amps which include Nait XS, 202/200 and 282/250DR, my view is the Harbeth will sound better if you give it more power. A more relaxed and effortless sound with improved refinement, separation and detail. The higher level amps will likely give more but the 282/250DR has somehow exceeded my expectations, providing a high quality sound with the SHL5+. 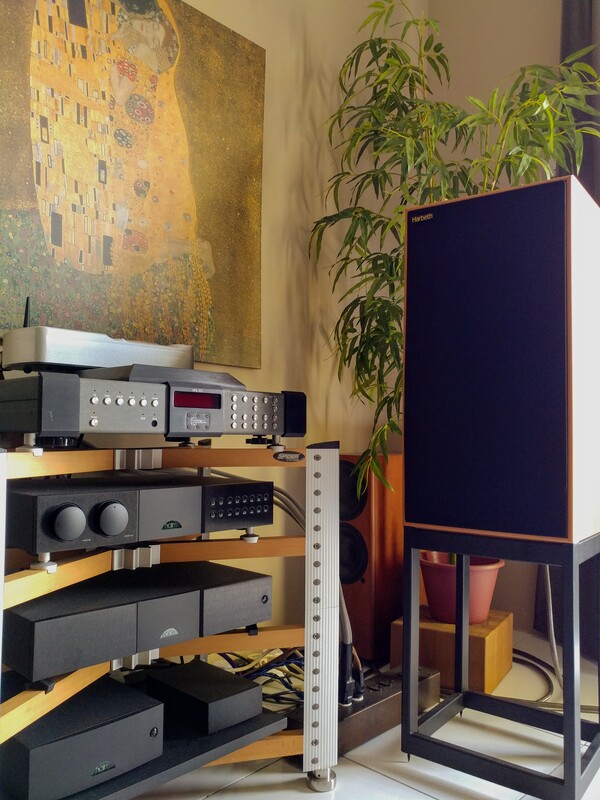 A friend of mine said his LFD NCSE 3 drives a pair of the Harbeth 40.2 very well. I had found that the Fraimships under Skylan’s feet brought good acuracy to the low medium and helped speed in this region of the spectrum. I can see from your pictures that you use spikes for the stands. So far, my Tonträger are placed directly on the floating wooden floor, same as with the speakers on the stands. I will try out different solutions. My 5+ are placed 103cm from the front wall, measured from the baffle and 175cm cc baffle to side walls. Work really well. Will add some pictures later. what is the distance between the speakers? 192 cm between inner walls. I have compared short wall vs long wall several times and if possible it`s worth spending some time to try different placement. Added a Wireworld Matrix 2 powerblock. Using only NAIM Power Line-lite on all devices. Into my Harbeth SHL5+ 40th Anniversarys on Something Solid XF stands. This combination is just stunning. It seems that whatever you throw at the Harbeths they still don’t end up being the weak point in a system. Really remarkable. 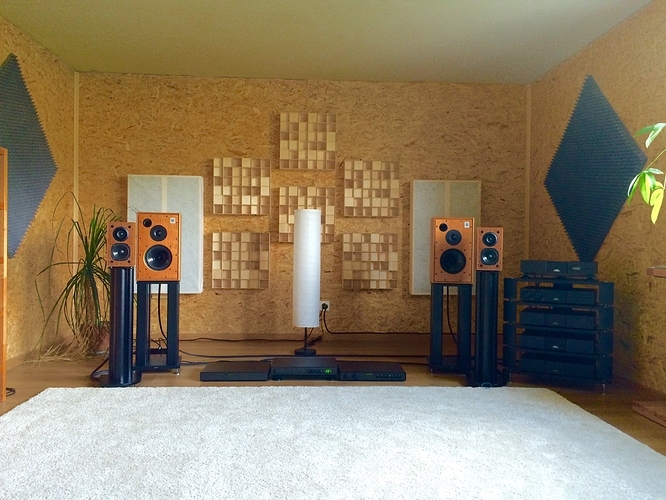 Harbeth is so far from Naim soundwise - it’s unbeliable. 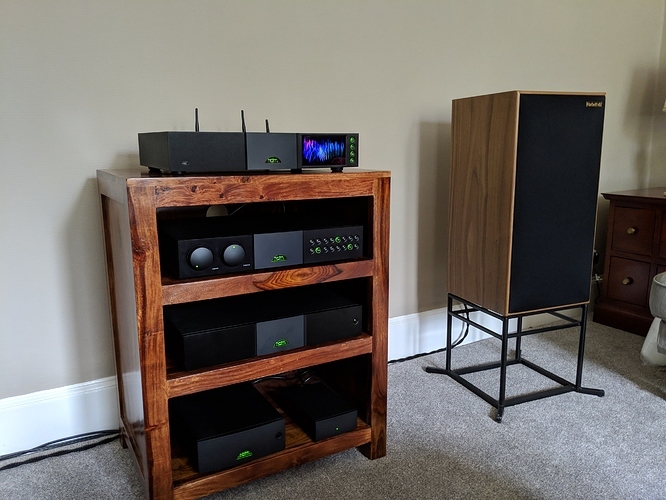 Compare SL2, SBL with any model of Harbeth and the latter is a laugh, Naim speakers are thoughtful technology and brainpower… Harbeth is just fog and resonances. Sorry. …if so, the only problem of course is that Naim no longer make speakers themselves. I thought the Harbeth speakers at the Bristol show sounded very good, but have no idea what was driving them.